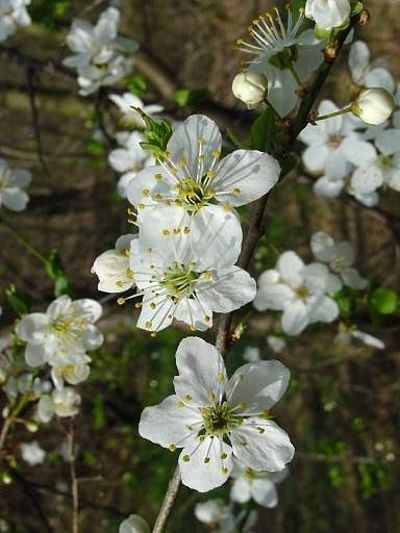 Description: The cherry plum originated in Eastern Europe. It is tree that often grows like a bush, reaching a height up to 40 feet. Often planted as a (cut) hedge (above all in England). The shape of the leaves is oval and serrated; the flowers are shining white and five-petaled. It blooms between February and April, before the leaves open. It is difficult to distance oneself from something. One has worries about emotional knee-jerk reactions, an uncontrolled temperament. One worries about losing control. One worries about losing oneÂ´s mind.